February 16, 2012 (LifeSiteNews.com) - The Sisters of Life, a group of Catholic nuns who take a sacred vow to protect and enhance the sacredness of human life, say they dont fall under the narrow religious exemption under the Obama administrations new insurance mandate, meaning the rule would force them to break their promises to God. This mandate will gravely violate the individual and collective religious liberties of the Sisters of Life and millions of others by forcing us to pay for abortion-inducing drugs, sterilization, and artificial contraception against our conscience, said the sisters in a statement Thursday. Click like if you want to end abortion! The Sisters of Life were founded in 1991 by Cardinal John OConnor of New York, a forceful opponent of abortion. The religious group numbers among countless Catholic universities, hospitals, and charities that are not covered by the religious exemption in the mandate. President Obama last Friday said he would adjust the mandate by forcing health insurers to offer religious employees birth control for free, a move criticized by Catholic groups, including the U.S. bishops, as vastly inadequate. The only just solution to this infringement of rights is to rescind the HHS rule, they write. Read the Sisters full statement here. Rev. 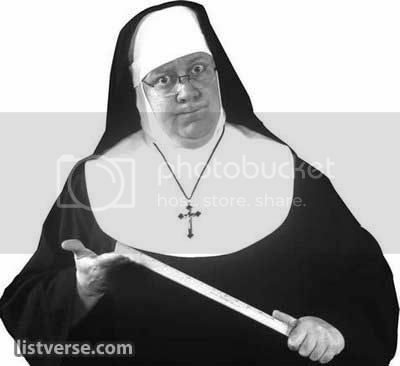 Mother Superior wants to tell the White House what it may do with its contraceptives but she knows Jesus would not approve of such language. She will instead be burning the nasty things out back of the convent Saturday night. Shouldn’t pro-life nuns be redundant? Yes, but this is a special charism that they emphasize. It is central to their mission (as opposed to contemplation, teaching, hospitals, tending to the poor, etc.). Okay, I did not know that. Thank you. I was thinking the SAME thing! Should be redundant, but sadly, in these highly IMMORAL times, one must describe certin nuns as being Pro-Life. It was interesting to read George Neumayr’s column in the American Spectator showing the pro- Obama nun,Sr. Keehan gets paid 962,467 dollars a year by the Obama administration.I guess we should always look at the bottom line.